An additional, optional aspect of tessellations is the possibility of their application to their three-dimensional cousins, namely polyhedra, that is by taking an arbitrary tessellation and then applying it to an appropriate polyhedron. As a rule, such a procedure is only applicable to the more ‘simpler' polyhedra, such as with the Platonic and Archimedean solids, as they consist of regular polygons, along with other polyhedra of a similar ‘simple' nature, say of a Stella Octangula. Other polyhedrons, such as the various stellations, are impractical for such purposes, as they frequently consist of ‘spikes' that will defy tessellation. However, despite the above limitations of numbers concerning ‘practical' polyhedra, nonetheless there are still more than sufficient to explore numerous possibilities in this field. 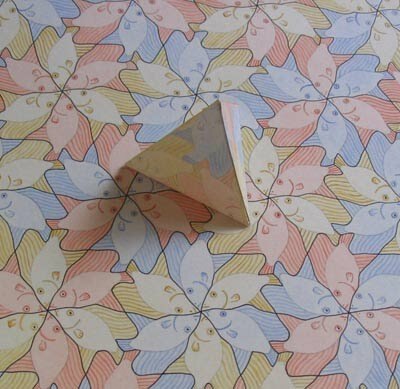 Now, it may be thought that the task of ‘transferring' both ‘non-representational' and ‘representational' tessellation examples would be straightforward, but in general terms it will be found this is not actually so. As such, for a given life-like tessellation, the underlying polygon may indeed be ‘used' to tessellate the polyhedra in the form of nets, from which when duly assembled as a solid one finds that the life-like tessellation does not in fact tessellate in three-dimensions. In addition, even when a net is suitable the coloration it may also need to be suitably ‘adapted.' Therefore, in essence, each tessellation of necessity has to be ‘investigated' afresh for both of these purposes. Concerning Escher's efforts in this field, it can be said that he somewhat neglected the possibilities, with only a few completed examples. Oddly, he seemed to neglect basics, with only one example of the five platonic solids, a Dodecahedron (of ‘turtles'). 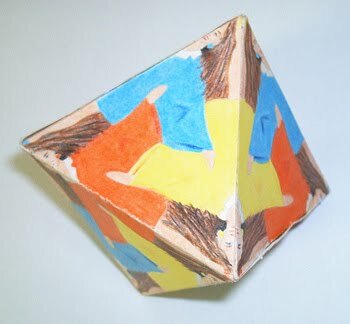 A further example was that of a Rhombic Dodecahedron (of ‘bat, fish, lizard'). These can be seen in Visions of Symmetry, page 246). As such, I find this shortfall most surprising, as the ‘decoration' of polyhedra in this manner undoubtedly can be regarded as a natural progression of ones studies. 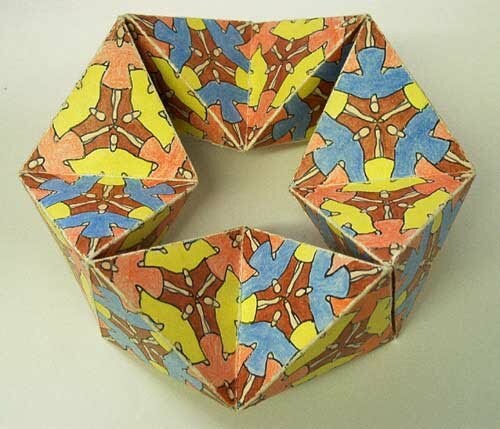 Some further examples concerning the ‘adaptation' of Escher's tessellations to polyhedra (by Doris Schattschneider) can be found in M.C. Escher Kaleidocycles, pages 22-28, where the five platonic solids as well as a cuboctahedron are thus duly shown with his tessellations. However, the above is only really a snapshot of the possibilities, and indeed a book on the subject per se is decidedly overdue. As such, it is most hard to find studies in this (admittedly specialised, albeit inherently simple, field), and so I thus consider that this has been somewhat neglected in the mathematical literature. The polyhedron here is known as a Kaleidocycle, of which further details concerning its genesis can be found in M.C. Escher Kaleidocycles by Doris Schattschneider and Wallace Walker, of which many of Escher's tessellations have been duly 'adapted' to this model, and similarly, with myself, here shown with the girls of Human Figures, No.1. A tetrahedron with fish motifs, placed on its underlying tessellation, Fish 2, No.2. An octahedron, with the girl motif from Human Figures, No.1. 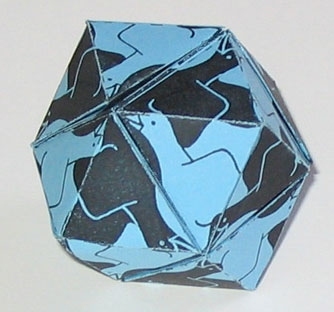 A rhombic dodecahedron, with bird motifs (of which the source tessellation is not shown in any of the Birds pages). Incidentally, this model was formed by the process of stellating a cube with right-angled pyramids, of the below two models, Nos.5 and 6. 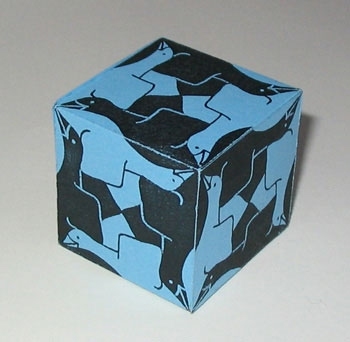 A cube, with bird motifs (of which the source tessellation is not shown on any of the Birds pages). Interestingly, for those interested in perception, and more specifically the 'reversible Necker cube', this will also spontaneously invert, even with the motifs. This occurs despite the cube having been photographed at an angle that although is quite close to the ideal of all three sides being shown equally, this was in fact slightly offset, as when photographed this was not planned with the Necker aspect in mind. 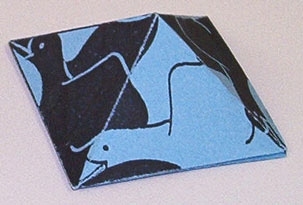 A right-angled pyramid with bird motifs (of which the source tessellation is not as yet shown on any of the Birds pages).